Robert Summers Handsigned & Numbered Limited Edition:"One Southern Morn"
Image Size: 20 1/4" x 30"
About the Art: This beautiful print symbolically depicts for the first time four of the most acclaimed and legendary Confederate Generals riding together on their favorite horses one foggy Southern Morning. The General on the left riding "Sir Oliver", led a Calvary unit in conducting so many successful lightning fast raids on the Union Army that he received a vote of thanks from the Confederate Congress. He became known as the "Thunderbolt" of the Confederacy. He is "John Hunt Morgan". 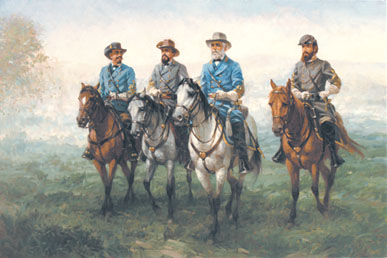 The General riding "Traveller", in the center was offered command of the Union Army by President Abraham Lincoln six days after the start of the Civil War. He refused by stating "he could take no part in an invasion of his native South". He eventually obtained the highest rank of any officer in the Confederate military with the title of "The General in Chief of the Armies of the Confederate States". He is "Robert E. Lee". The General on the right riding "Little Sorrel", was a brilliant military tactician responsible for numerous Union Army defeats throughout Virginia. His real name was Thomas Jonathan Jackson. However, he earned such an enduring nickname during the first major battle of the Civil War at Manassas, Virginia that he is still referred to as "Stonewall Jackson". Each print is accompanied by a Certificate of Authenticity that includes a brief biography of each General.